As previously described in Step 4, it is necessary to provide a back-up material behind the Heatseal Band when it is mounted on the Heatseal Jaw Bar or platen. It is also necessary to provide a cushion or facing on the opposite jaw bar or platen face. The selection of the best combination of these components may require some testing to determine which combination of these elements is most effective with the film to be processed. There are several considerations in making the selection and the following information should be considered. It is essential that the Heatseal Band be both electrically and thermally insulated from the jaw bar. The most common materials used for this purpose are, PTFE tape, Siglaha, and Durit. 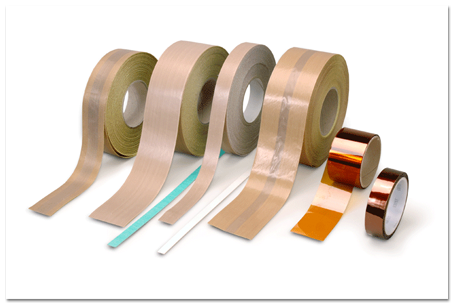 Commonly called “PTFE Tape”, this versatile material is used in many ways in heat sealing set-ups. It is sometimes used beneath the Heatseal Band on the Heatseal Jaw face. When 3 mil Cover Strip (see Step 6. Anti-Stick Provisions) is used, it has the advantage of providing marginally adequate electrical insulation and minimal thermal insulation. This is good when rapid cooling is desired as in high speed automatic machines. The jaw bar should be anodized and PTFE SA Tape must be replaced frequently to assure that it is not worn through and allow the Heatseal Band to become grounded to the jaw. Other materials are safer and more durable for this application. Also available with self-adhesive backing, 1 mm thick, both 12 and 15 mm widths are standard. This material can be had in other widths as well. Durit is less hard and more pliable than Siglaha. It has an operating temperature range of up to 400°C, it is a good insulator, and has lower thermal conductivity than Siglaha or Cover Strip. It is durable and a good choice for machines operating with long heating cycles or constant heat or where cool-down rate is not critical. The treatment of the face of the opposing jaw is very important in obtaining a perfect seal. The thickness and hardness of the jaw face can make the difference between a perfect seal or cut and a worthless seal or cut. 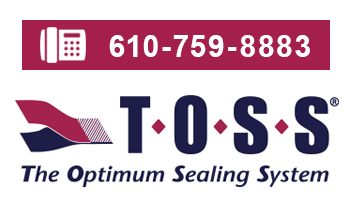 Misalignment of the jaws or platens by as little as a few thousandths of an inch can make the difference between a perfect seal and an unacceptable one. The face of the opposing jaw must be soft enough to deform and compensate for any deviation or deformation in the alignment or flatness of the face of the Heatseal Jaw. In addition, the jaw facing must be covered with PTFE-SA Tape to assure a clean release of the film after sealing. When sealing with a band such as a Tapered Band, the opposing jaw face must be soft enough to conform to the shape of the band, thereby assuring contact and equal force being distributed over the area to be sealed. It must also be hard enough to present a firm face so that the jaw force is directed principally on the band and not on the adjacent surfaces of the soft face. For general applications a strip of self-adhesive, 30° durometer silicone rubber, 2 mm thick and 15 mm wide is satisfactory. Durometers of up to 60° Shore Hardness or Durit are often used for cutting and work well, even on thin films. The selection is a little more difficult when using bands that both cut and provide a wider seal. Bands such as Beaded Bands and T-Profile Bands require a silicon pad on the opposite jaw that will deform enough to force the plastic film to conform to the face of the band while concurrently providing sufficient firmness to allow the ridge on the band to cut. Depending upon the composition and the thickness of the film, the silicone face may need to be up to 60° Durometer in hardness and perhaps up to 6 mm thick. This is still a little more art than science, but the people at can help you with your specific applications.